It Arrived the Trigg Trike Kit is Quality. Fully assembled bolted up just like they said it would..who would of thunk. Anyhow, took about 2-3 hours and off I went. Dialing it in was super easy(thanks for the tip Tinman) and I've put about 500 miles on it with no squeaks, rattles, etc. I lowered the tire pressure on the kit to 12 lbs, rear tire I Darksided and put 33 in it ...perfect. High kudos to Trigg for making a quality piece of equipment. you can see my Trigg trike kit on my photo album.I have over 25k kl on my trike and I love it. Did not see Precious logo on your bike pics in your albums. I need to get my wife to post the pics. I see about posting some pics when I come back from my 150 kl coffee run. Hi Guys just order a trigg for the Swing, after a very hard trip over the Thanksgiving holiday to El Paso Tx and having too many lean overs on me that my arms and back cant keep doing it. So I want to replace the rear drive tire to a Auto tire and would like to know if you have any thoughts on the matter. Having it installed free by Trigg and if I bring the tire they will do that also. The trike kits look great but I have a couple of questions. How does it affect acceleration? How does it affect mileage? Do yours have reverse and if so does it work off the battery or engine? stalling or doing oil change ,Get 2 eye hooks in the ceiling and 2 ratchet strap to lift the back end to do all your service works. Attach to the passenger hand rails to lift the back end. MajikalJoe riding at highway speeds will lower your mileage. A dirty air filter will also lower your mileage. You don't say what year Silverwing you have, but the 08 and newer have an O-2 sensor which gives better mileage too. I have an 08 and an 07 and the 08 gets better mileage than the 07. What a nice Christmas gift to get yourself. I hope the trigg trike kit adds many years to your riding. my calculations where made with imperial gallons ,not US gallons,and my riding is mostly flat land with some rolling hills , and cooler temperatures average 22 C.,and 99% highway riding,no stop and go riding. The trigg recomended suspension setting needs to be adjusted to a lighter setting to add more stability to the swing,and will put less ware on the drive wheel equals more miles before tire change. Well Tinman I have a 2013 with just under 1000 miles when I left with new oil and filter. Around town and little trips under 50 miles I was getting as much as 56mpg US gal I know the wind played hell with me and I ran around 65 to 75 some 80's on I-20 and 10. I do know my new full-face helmet would knock me around if I didn't get my head down a little out of the air stream. Do you think I had pack to much and too high on the back seat? Always use 93 Octane Sunoco Fuel and tires aired up. Thank you all for the info. I have an 08 SWing with just over 19,000 miles on it. I'm now in the process of putting a new belt and Dr. Sliders on it this winter. The belt was changed at 17,700 miles but it sat for two years under a tarp. I put new tires, battery on it and changed the oil and filter plus the air filter. I'll probably ride it this coming summer like it is and save up for the Trigg Kit for next winter. I'm not really all that worried if I lose a couple of miles per gallon with the kit and I don't care to "pop wheelies" with it either. I am 68 years old and want to ride for several more years so a trike kit is in my future. majikal joe ,with the low milage,on your swing,I would keep the mc tire on and change to a car tire at your next oil change .High octane gas won't improve the gas milage . Honda calls for 87 octane gas for the swing. 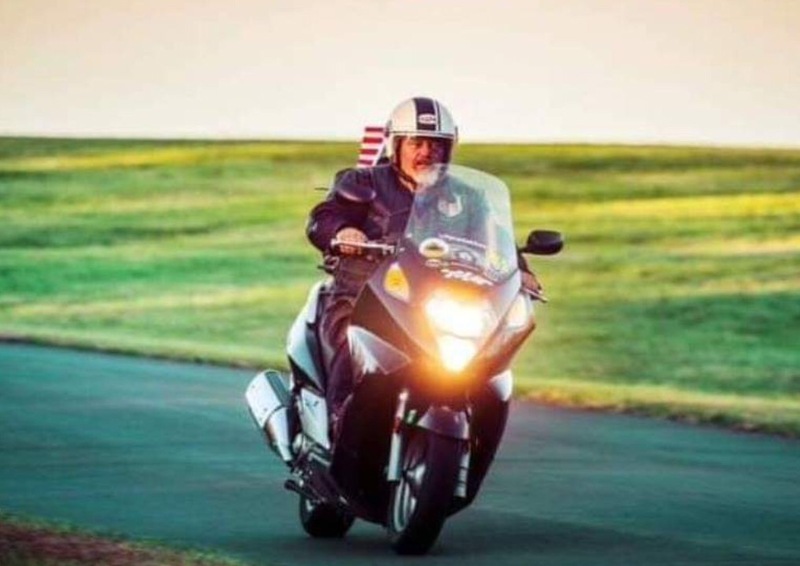 The givi adjustable wind screen will eliminate wind buffeting.With my trig trike kit I am still faster off the line then a 1500 cc cruiser,and with a lighter pressure setting on the driven wheel I can squeal the tire at take off especially if there a light sanding at a stop light.